A week before an injunction imposed by Nanaimo’s City Council was set to displace hundreds from Discontent City, a group of tent city residents and their supporters, including members of Alliance Against Displacement and residents of Anita Place tent city in Maple Ridge, occupied a school abandoned because of austerity cuts to public education. The Schoolhouse Squat was born. Drawing strength from our solidarity, the squat established a visible front against the suffocating chains of anti-Indigenous and anti-homeless policing, social isolation, and institutionalization. The 17 hours we spent inside the Schoolhouse Squat, from the moment we entered and blockaded the building to the aggressive police operation that forced us out, were monumental in expanding the political imaginations of our group of homeless, working class, and Indigenous fighters, and in building our collective power for the fight pushing forward. On September 21st, Judge Skolrood ruled in favour of the City’s of Nanaimo’s injunction application to dismantle Discontent City by October 12th. It was an explicit attack on the peaceful, self-governing community which had grown to 300 residents over five months. The Court’s decision would force residents to survive the cold winter in isolation, a path tent city resident council member Rod Boisclair described as “a death sentence”. Discontent City resident and Schoolhouse Squatter, Cori Mitchell, described the importance of the tent city in her life: “I have been living at Discontent City since day three. I have many friends living there, my daughter is there as well. I worked until I came down [to Nanaimo] to take care of my dad. And it snowballed after, just one thing after another. Thank god for tent city, because I can put my trailer in there, and try to get myself together to get employment”. Nanaimo Director of Public Safety and Fire chief Karen Fry’s solution to the displacement of Cori, Rod, and hundreds more was bus tickets out of town for residents who have friends and family to stay with and “a map of the City’s parks” for those who don’t. When a journalist asked Cori if tent cities are a better option than shelters, Cori’s reply showed the crude reality of homelessness in Nanaimo: “There are no shelters! There are no options. They have maybe three beds available, and they are taken. Every night. The lineup for the shelter is ridiculous”. 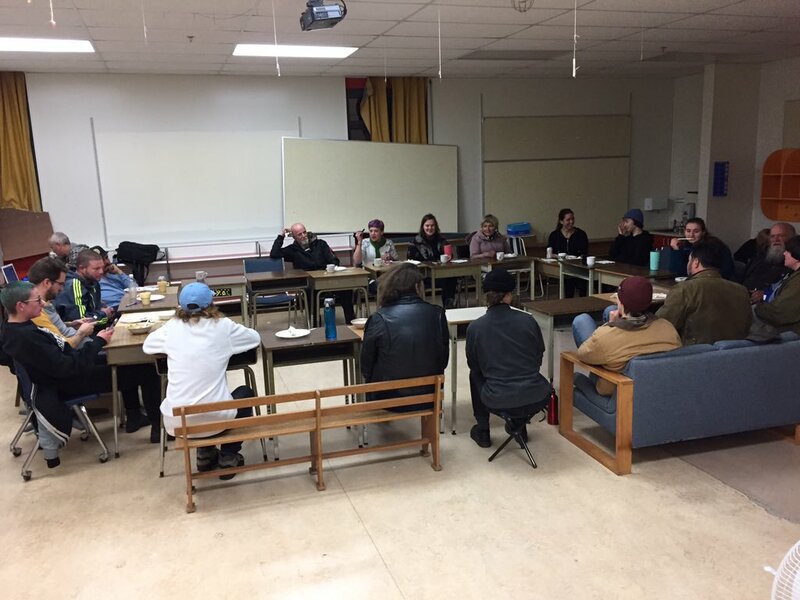 The Schoolhouse Squat gave a platform for residents of Discontent City to speak up about conditions the City of Nanaimo forced them into, and the ways they have been silenced, attacked, and continually robbed of their agency. An hour before the squat began, the Province promised to build 170 units of Atco work-camp trailer style housing, a move that Discontent City leaders have criticized as neither adequate nor appropriate to the needs of the nearly 1,000 homeless residents of Nanaimo. BC Housing’s trailers will be run under the “supportive housing” model, which involves 24-hour surveillance, collaboration between staff and police, restrictive guest policies, and the refusal of tenant rights under the Provincial Residential Tenancy Act. Supportive housing follows a pattern seen across BC of state-led containment strategies under the facade of “helping the homeless”. 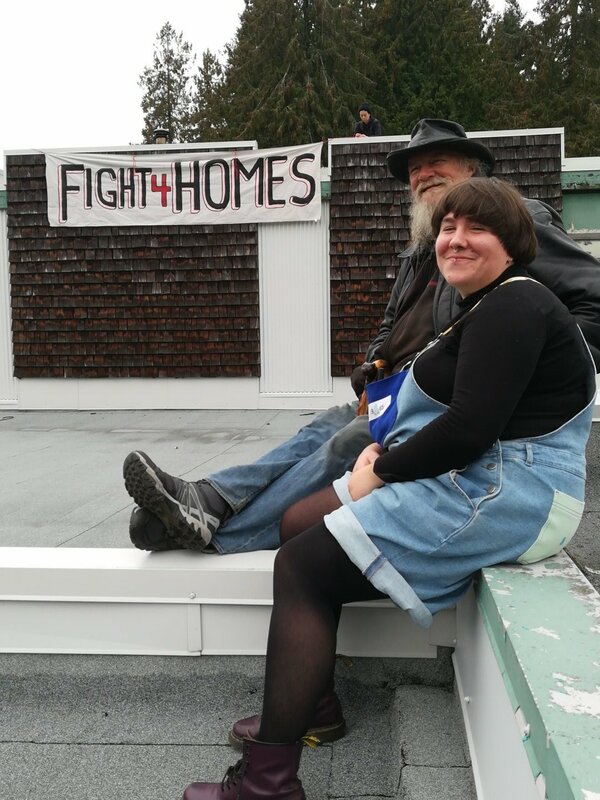 While on the roof of the school, another Discontent City resident and Schoolhouse Squatter, Ruby, explained to a journalist over the phone, “Supportive housing is not a home, it’s a place of incarceration. To be stuck in a place where they are going to fence us in and monitor us, tell us what we can and cannot do, who can and cannot come to see us, when they can or cannot do it. I don’t know if this is how you would like to live but it is most certainly not how I want to live”. The Schoolhouse Squatters challenged the “benevolent” arms of social worker-cloaked institutions that are only set to control and contain us. For 17 hours, we created a space where we exercised autonomy and supported one another, a practice that inherently challenges the state’s paternalistic “assistance” to the poor. Once the building was secured from an immediate assault by the police, we all headed upstairs. 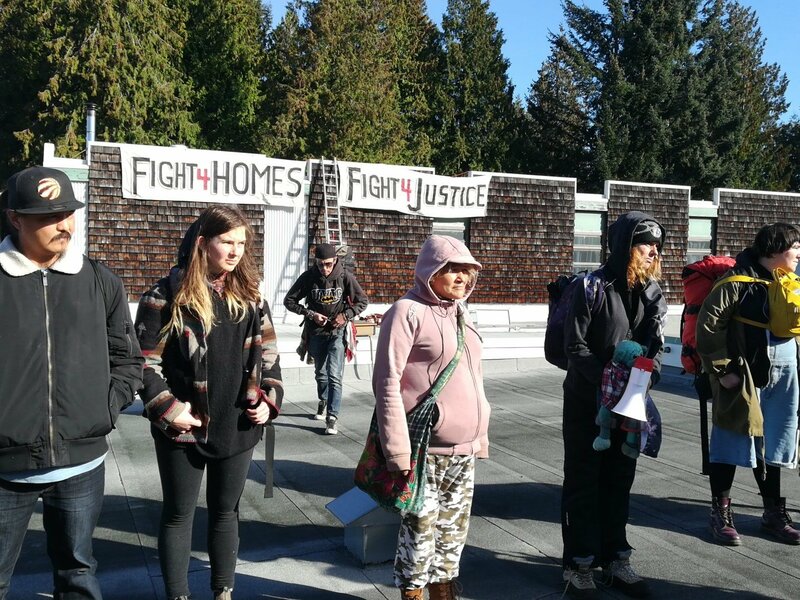 On the roof, we read our statement and addressed the growing crowd of anti-homeless bigots and bystanders. The police taped off the entire block surrounding the school soon after we entered, turning the neighbourhood into a crime scene and stopping the rest of our group from joining us. But we were inside: we had walls, a roof, and each other for support and protection, heat to keep us warm, and enough food to last for a couple of days. Discontent City residents later described the feeling of security they had while staying in the building. For Cori, “Once we were inside the school yesterday, we cleaned, we cooked as a community. We all had a meal, warm bellies. It was a dry, warm place for people to sleep. We were together and felt safe despite the threatening voices outside. People were really violent, telling us to jump off the building. They said they would burn it down while we were in there”. Although the size and violent discourse of the crowd was shocking, the anti-poor hatred was not new for people experiencing homelessness; the deeply appreciated difference was being together inside a building for protection from the elements—from both the weather, and the violence of bigots and cops. Gathered around a freshly-made pot of chilli on what could have been the first of many dinners with our friends and comrades, a sense of warmth and solidarity surrounded us. As the evening went on, we arranged a sleeping set-up, dining room, and organized a schedule to keep watch on the roof and prepare collective meals. 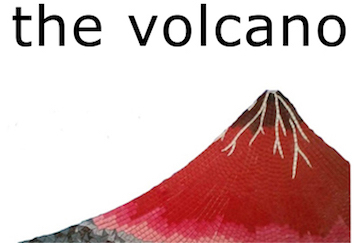 The uncertainty about how long we would be able to stay in our new home was quieted by our energy and feelings of relative freedom and safety. Discontent resident Rob Barker shared that it was “the best time he had since the beginning of the tent city.” The Schoolhouse Squat allowed us to build solidarity with the Discontent community while sharing the comfort and security of being indoors—for some, like Rob, it was the first time sleeping indoors in months. Repurposing unused buildings for homes is a vital way to provide for ourselves and one another, while resisting the state’s agenda of homeless death and building our collective power. For Michelle, who lives at Discontent City with her family, the highlight of this action was seeing “everybody work together to get things done that needed to be done”. Building space for homeless people’s autonomy and survival is a necessity across BC, where municipalities are choosing to respond to homelessness by criminalizing poor people, while allowing anti-homeless bigotry to thrive. We see this in Nanaimo, where homeless people face threats from the Soldiers of Odin, a white supremacist group, and non-stop harassment from police and City Council. The destructive logics of capitalism and colonialism are the only reason people are sleeping outside when plenty of heated buildings sit empty. The Schoolhouse Squat was on the occupied territory of the Snuneymuxw nation. Our group never made a claim to “own” the building or the land, instead pledging to use both for the survival of Discontent residents and others without shelter. The goal of the squat was to establish a thriving community where we could protect ourselves from winter conditions and the relentless violence of the City and police, while also fighting to abolish property rights, which are built on the continual oppression of working class and Indigenous people. As Rod articulates, “the City and the Province weren’t doing what they said they would do. So we did it ourselves”. Under Section 7 Charter rights, which are supposed to protect the security of a person and protection of personal belongings, we took an empty building to protect and defend ourselves. Drawing by Catherine Hart, Instagram: cathartart. Tent cities rupture the current social order rooted in the systemic silencing of and state-sanctioned violence against Indigenous and working class peoples by appropriating public space to use as a resource that follows the needs of a community. The logic of the world we make in tent cities and the Schoolhouse Squat is that resources should be used by all of those in need, not exclusively accessed by owners and protected by borders of property and nation state. Homeless people have created powerful hubs of resistance across southwest BC, forming an archipelago of people on the margins fighting for one another. Their fight for survival seeks to destroy the systems of power that value property and laws over lives, while the Canadian settler state uses hard and soft power to try to crush and control them. 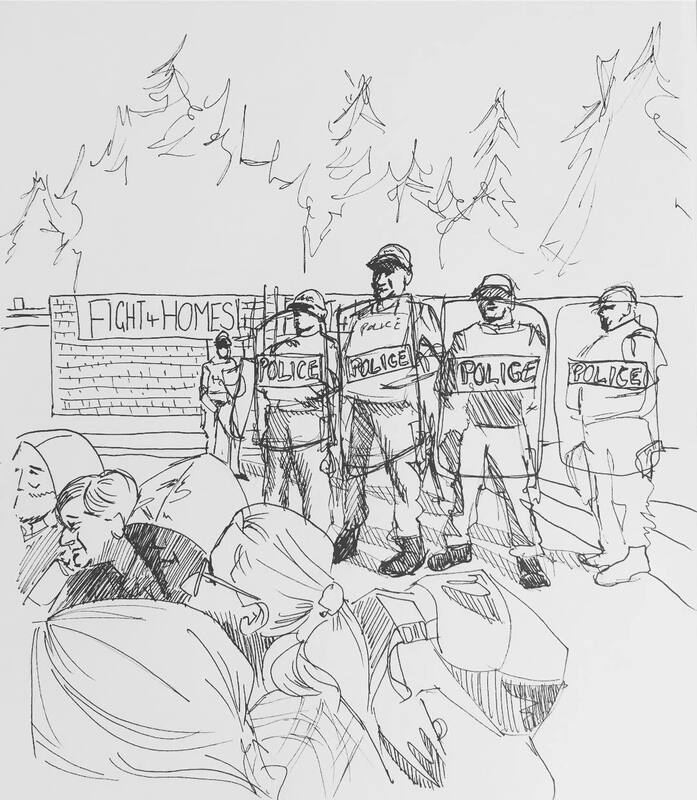 Tent cities in Maple Ridge, Saanich, and Nanaimo face constant attacks from the state, which attempt to undermine their power and autonomy, or dismantle them altogether: police raids, court-ordered injunctions, punitive fire orders, harassment from by-law officers, and the constant presence of social service workers.The Schoolhouse Squat emerged because of these constant attacks—an alternative must be created. Our 17 hours inside the school showed us how powerful the future we are building can be; as a common front of Indigenous and working class people, we will keep fighting for a world that doesn’t force people to sleep outside while buildings remain empty.